For the time-pressed investment writer, it is a crushingly familiar tale: you need to know – now – why that Brazilian sugar refiner sparkled during the month, or what drove that Swiss auto-parts giant over the speculative cliff. That’s where newcomer City Falcon comes in. 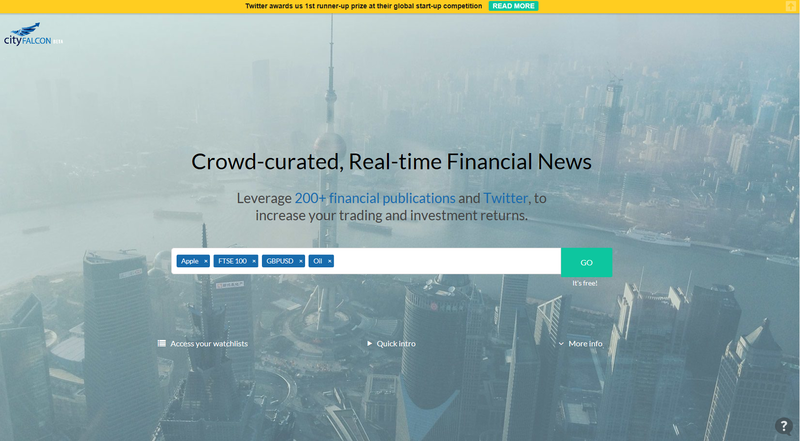 Basically an aggregator of financial news, City Falcon brings together info and stories from across the web for more than 1,500 securities, including stocks, commodities and foreign exchange. What makes it particularly useful, though, is that instead of cataloguing any old toot that mentions the company or commodity in question, it assigns its sources a Klout-like score, ensuring the stories its search-function yields are relevant and high quality. It’s still a young company, and so the site is not without its blips and omissions, but if it continues to improve, it could be indispensable. If you’re a relatively inexperienced investment writer, or even if you’re a seasoned campaigner, then the chances are that you will come across words, acronyms and toe-curling jargon that you just don’t understand. 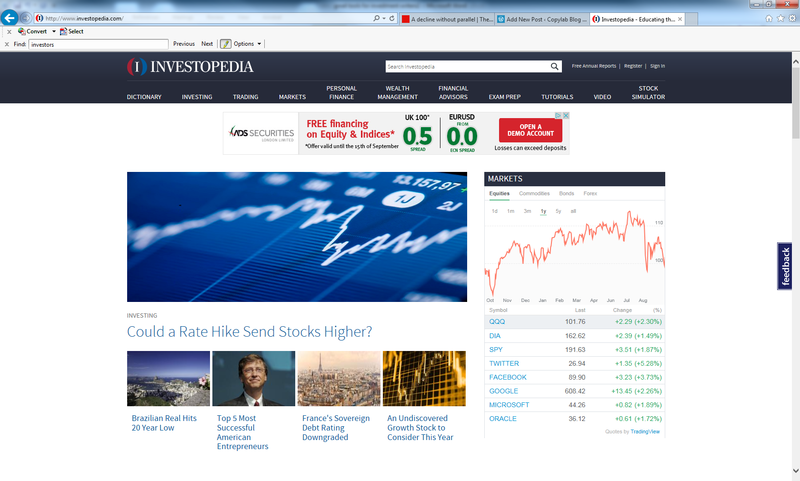 And that is why Investopedia is such an indispensable chum. Its online dictionary is easy to navigate and explains things in simple terms. But it’s not just the dictionary function that makes it so useful; the site contains links to relevant and absorbing articles and the online and videos tutorials are a great resource for demystifying terms such as “binary index” and “absorption costs”. And who could resist a “term of the day”? In the cutthroat world of writing style and grammatical diktats, disagreements over a capitalised currency or a misplaced hyphen can cause ructions that tear financial companies apart. OK, so maybe we exaggerate a little, but ensuring a logical, attractive and consistent style across a company’s entire marketing output can be a Herculean and highly divisive undertaking. 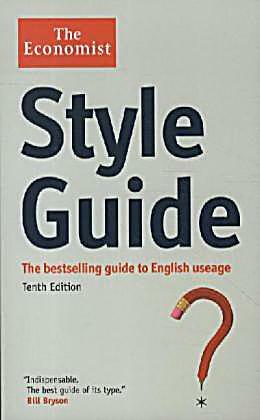 Which is why the Economist’s style guide is such an indispensable tool in the investment writer’s kit. Whether the point of contention is eg vs e.g. (the former) or healthcare vs health care (the latter), the Economist’s is such a wise and authoritative voice, it is practically the in-house style guide for the investment industry. Unless you’re one of the rarefied types who live and breathe credit markets, fixed income can be so dazzlingly complicated that keeping track of its various movements could easily be a full-time occupation in itself. If only there was a seasoned veteran – with more than 20 years’ top level experience – who had now left the industry and was able to use his vast expertise to provide frank and insightful updates on movements in all elements of credit markets, from government debt to junk. And if only those insights could be delivered to your inbox every morning. 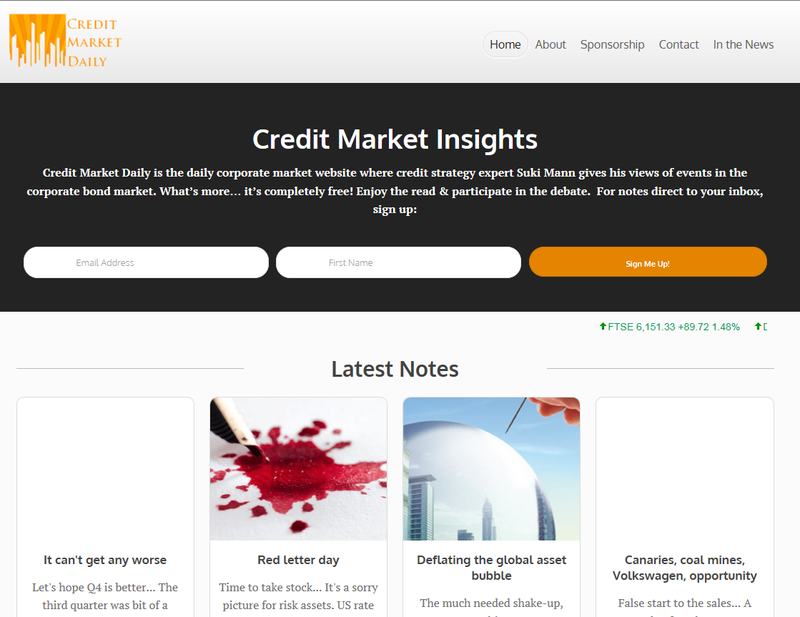 In fact, just such a fellow exists in the shape of Suki Mann and his blog, Credit Market Daily! And banking’s loss is most definitely investment writers’ gain. 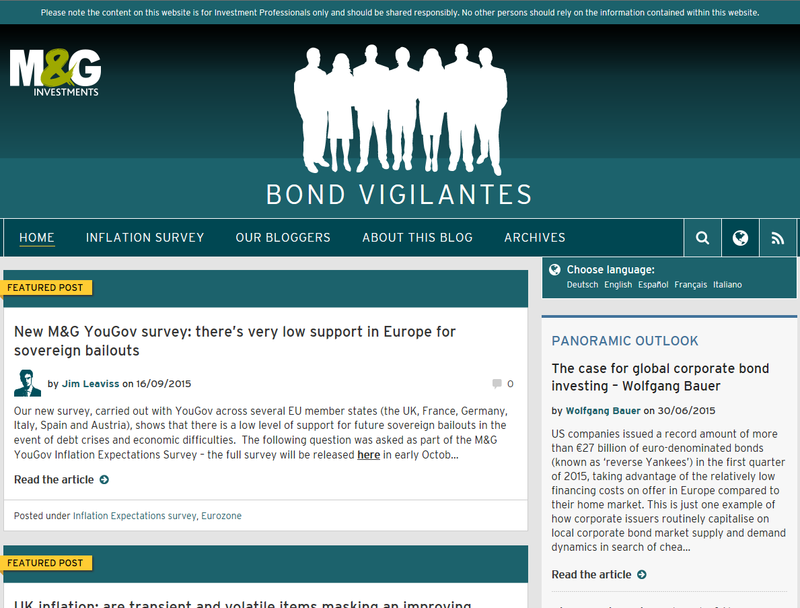 Of course, once you’re doing the actual writing about bonds, cold, hard data is the essential starting point. 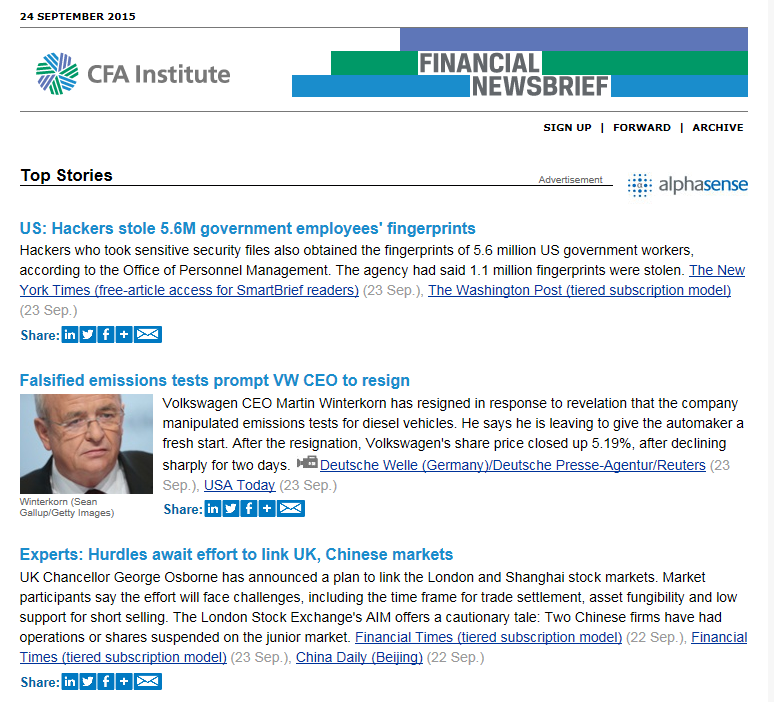 And yet the internet is surprisingly bereft of dependable, user-friendly sources of information on bond markets. One exceptional resource, however, is the historical data function on investing.com, which provides daily yield information on Treasuries, bunds, investment-grade and whatever other nuggets of data you require. And once you know the movement of the yield, you can then get merrily googling for any news on growth/inflation/interest-rate expectations that might have been influential. As an added bonus, Bond Vigilantes remain some of the most cherished, insightful and articulate bloggers of all matters bond anywhere online. They are also prolific tweeters of useful titbits that keep your market knowledge fresh. 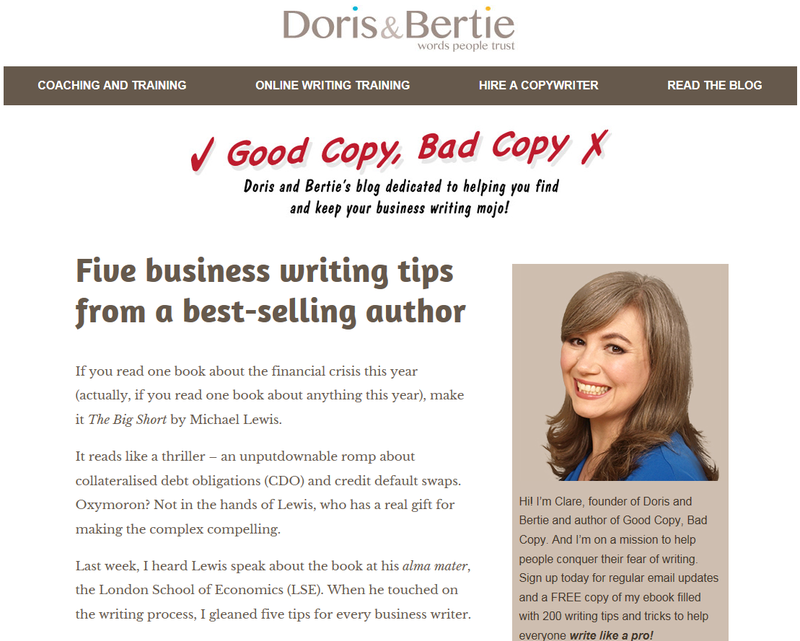 Doris & Bertie is a wonderful website and blog, produced by two copywriters who are — confusingly — called neither Doris nor Bertie. So much useful stuff is here: how to write an executive summary or report, how to slash your word count by 20%, how to sound *gulp* human. The writers here have a great knack of answering questions that have been bouncing around in your head for a while, such as just how long does it take to write a white paper/catalogue/website/viewpoint? And how should you respond when someone accuses you of “dumbing down”? Needless to say, every blog is succinct, to the point and full of ego-punctuating gems like: “that first paragraph is just a load of corporate throat-clearing anyway.” So sign up for the regular updates, read and learn!